The electricity department MSPDCL (DISCOM) in Tamenglong District is located at Gadailong under Tamenglong District, electricity being one of the essential service, It is the aim and objective of our department to ensure electrification and uninterrupted supply of this service to all the region under Tamenglong district. The department has a Divisional and Sub-Divisional offices in Tamenglong Head Quarter area and Tamei block. 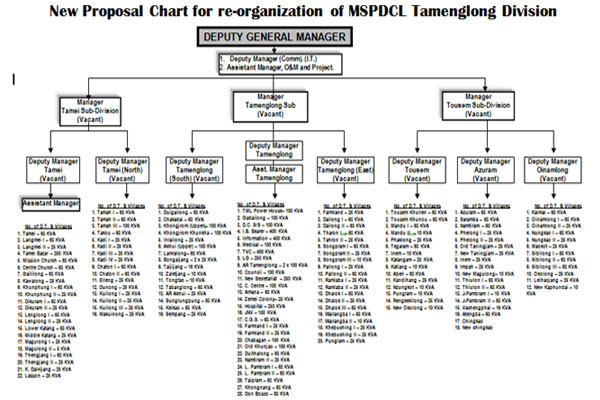 The electricity department, the then termed EDM has had a major change and was split into two part from February 2015 as MSPDCL (Manipur State Power Distribution Company Limited) or DISCOM and MSPCL (Manipur state power company limited) or TRANSCOM for efficient management of power utility in Manipur. MSPDCL or DISCOM mainly look after the distribution of power supply and are responsible for the operation and maintenance of 1) 11 KV line 2) 0.440KV line 3) 0.230 KV line 4) Service connection 5) Revenue Collection 6) Distribution of Transformers 7) Street light etc. 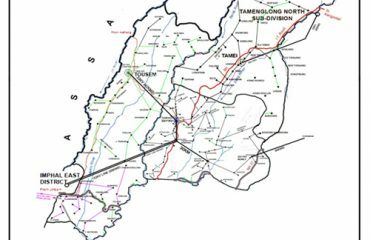 and MSPCL or TRANSCOM is responsible for the transmission line and power Sub-Station of Manipur power utility and are responsible for the management of 1) .440KV line 2) .132 KV (EHV) Extra High voltage line 3).33 KV line. As shown in the figure in the right. The Rajiv Gandhi Grameen Vidyutikaran Yojana (RGGVY) was launched in April 2005 by merging all ongoing schemes.Under the programme, 90% grant is provided by Govt. of India and 10% as loan by Rural Electrification Corporation (REC) to the State Governments. Rural Electrification Corporation (REC) is the nodal agency for the programme. The RGGVY Xth plan (Rajiv Gandhi Grameen Vidyutikaran Yojana) scheme has been taken up for the electrification of 1). 6 (six) Nos. of un-electrified villages 2). 24 Nos. of De-electrified villages 3). 15 Nos. of Habitation villages 4). 43 Nos. of Electrified villages along with providing of 1951 Nos. of BPL household in Tamenglong and Noney District under the Xth plan RGGVY scheme. The execution and implementation of work for RGGVY Xth plan scheme has been taken up by the private contractor firm M/S Utkal Galvanizers Limited, Bhubaneswar, Orissa, India. The RGGVY XIIth plan (Rajiv Gandhi Grameen Vidyutikaran Yojana) scheme is an extension of RGGVY Xth plan which covers the villages left out in RGGVY XIIth plan has been taken up for the electrification of 49(forty nine) Nos. of villages under Tamenglong and Noney District. The execution and implementation of work for RGGVY XIIth plan scheme has been taken up by the private contractor firm Indo Nabin Projects Limited Paona Bazar Imphal, Manipur. Strengthening of sub-transmission and distribution networks in the urban areas. Metering of distribution transformers / feeders / consumers in the urban areas. IT enablement of distribution sector and strengthening of distribution network under R-APDRP for 12th and 13th Plans by carrying forward the approved outlay for R-APDRP to IPDS. Schemes for Enterprise Resource Planning (ERP) and IT enablement of balance urban towns are also included under IPDS. Scope of IT enablement has been extended to all 4041 towns as per Census 2011. Underground cabling to include additional demand of States and smart metering solution for performing UDAY States and Solar panels on Govt. buildings with net-metering are also permissible under the scheme. 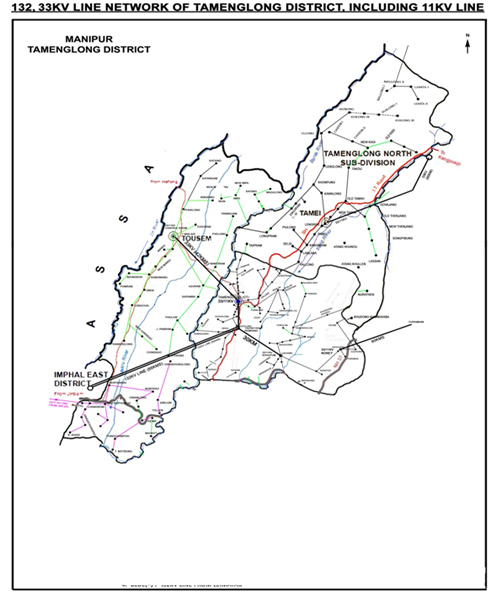 The North Eastern Council was created to complement and supplement the developmental efforts of the States in terms of institution building, transport and communication, power generation and transmission and creation of different kinds of infrastructural facilities with a view to positioning the States to launch themselves into a self-sustaining growth trajectory.The NEC Scheme has been taken up for the Electrification of 22 Nos. of left out villages which is 12 Nos. of villages namely 1). KANDIHANG 2). PHOKLONG 3).LONGCHAI 4). OLD IMPA 5). INEM 6). NEW MAGULONG 7). RANKEKILONG 8). ABEN 9). MANDU KHUNOU (H) 10). LONGJON 11). NEW IMPA in Tousem under Tamenglong District and 10 Nos. of villages namely 1).TOUSANG KHUNTHAK (H) 2). TOUSANG KHUNOU(H) 3). LEISOK KHUNOU (H) 4). NUNGNANG 5) MUKTINA 6) MUKTI KHULLEN 7) LONGPI 8) LENGLONG 9). TAIKHANG10) SEMPAT GANGTE 11). 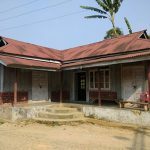 LEOKOT 12) NUNGLEIBAND – IV (H) in Nungba under Noney District and the scheme is also for providing of prepaid meters in District Head Quarters and Sub-Divisional Head Quarters. Providing Solar Photovoltaic (SPV) based standalone system for un-electrified households located in remote and inaccessible villages/habitations, where grid extension is not feasible or cost-effective.